For toddlers, high chairs and a changing table are available in the „Café im Städtle” and a corner with some books and games is ready to be explored. You want to assure that you and your company get a table in the “Café im Städtle” ? 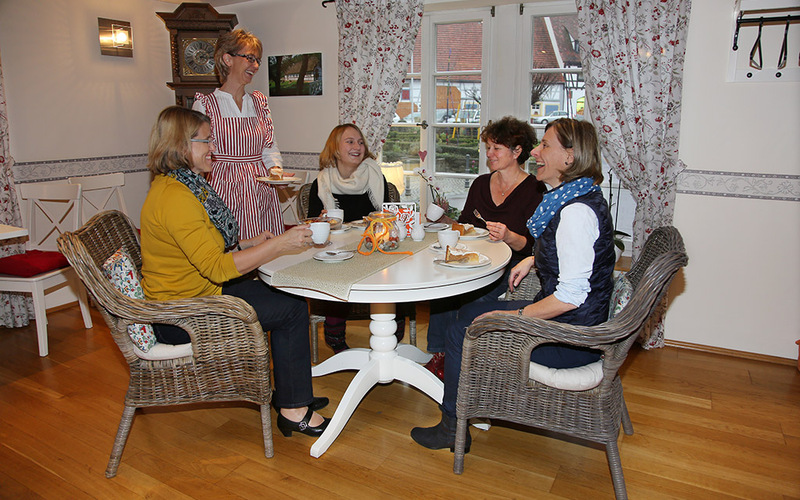 You are welcomed to contact us either by emailing us at info@hotel-cafe-vellberg.de or you give us a call at +49 (79 07) 5 88 01 00 to place your reservation. Reservations cannot be placed on Sundays and holidays. You want to bring your dog along? Sure! 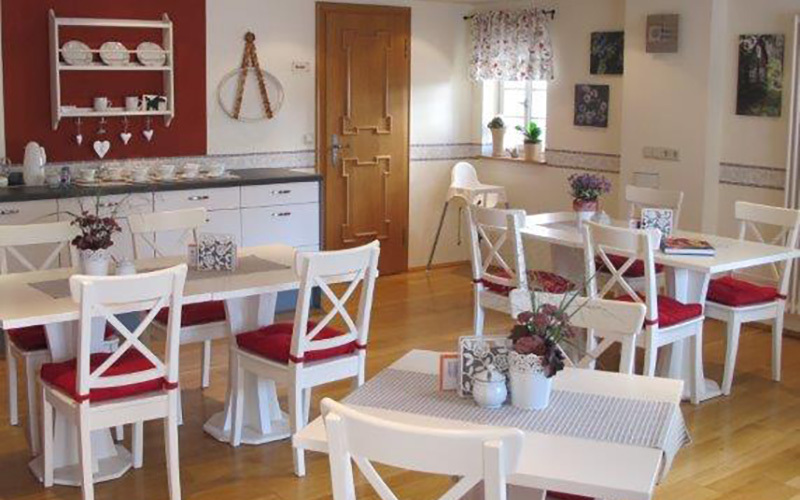 As long as your dog is on a leash and does not disturb the other guests he is warmly welcomed to our “Café im Städtle”. A blanket and a bowl of water are always ready, so that even he can enjoy the stay. Are you or is someone in your company affected by allergies? Of course, we will answer your questions about the allergens present in the pastries. In addition, a folder with the lists of all the used ingredients is placed at your disposal in the “Café im Städtle”. It would be our pleasure to try to adapt our daily offer to your requirements. In this case, please inform us about your wishes in advance to your visit. Breakfast in the „Café im Städtle“? With pleasure! Thursday to Saturday from 9 am to 11.30 am. Only possible with reservation by email, info@hotel-cafe-vellberg.de or by phone +49 (79 07) 5 88 01 00. Beverages à la carte. The buffet offers amongst others bread, bread rolls, cold cuts, cheeseboard, cream cheese, honey and different jams and marmalades. Furthermore fruit- and natural yoghourt, a variety of cereals, dry and fresh fruits. 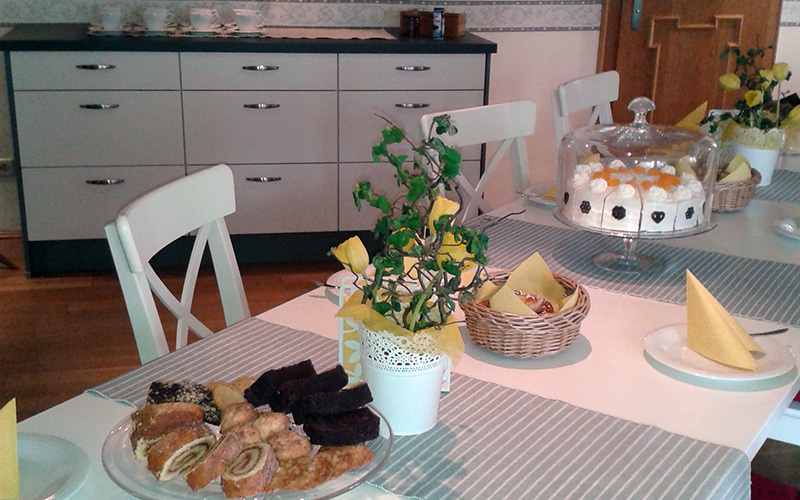 We offer the possibility for you to order in addition, eggs in different preparations, salmon and fruit salad. You want to make someone else happy? You are welcomed to purchase a gift certificate.